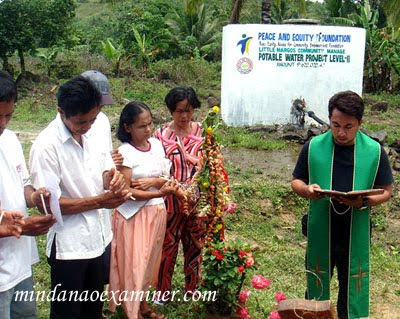 The Mindanao Examiner: Potable Water: Will there be enough? Potable Water: Will there be enough? ZAMBOANGA SIBUGAY, Philippines (Mindanao Examiner / Aug. 1, 2010) – Sweat drips from her back every time she and her children fetch pails of water from a neighboring village that is five kilometers away from their house. The 48-year-old Rosenda Palomares, a mother of nine, lives in a village called Little Margos in the town of Tungawan in Zamboanga Sibugay province. She, her children, as well as her neighbors, have been struggling to collect pails of water because their community cannot provide them direct access to a clean and safe drinking water. Situated about 26 kilometers away from the main downtown Tungawan, considered as one of the remotest villages of the province, Little Margos is just one of the many rural areas in the country where access to potable water is still a privilege. The village has been depending on rain, dug wells and rivers as their source of drinking water. There are also days wherein they will have to take the long treacherous road to the nearest neighboring village to draw water when their own supply runs out. These methods of water sourcing has been proven to pose serious health risks as a study conducted in the village showed that the lack of clean water supply makes its residents more prone to contracting diseases like diarrhea, cholera and other waterborne diseases. The Philippines is not the only country that suffers from the lack of potable water. In 2004, the World Health Organization and the United Nations Children's Fund reported that more than one billion people around the world still drink unsafe water. The report “Meeting the Millennium Development Goals" revealed that the growing disparity between those who can avail and those who cannot access basic services like clean water is killing around 4000 children every day and underlies many more of the 10 million child deaths every year. Waterborne diseases are also a major concern. Diarrhea kills at least 1.8 million people every year, mostly children, and the search for scarce drinking water results in 40 billion hours of lost work in Africa alone, their report says. But there are also "worrying trends," aggravated by rapid industrialization in many industrialized countries, where the percentage of people with access to clean drinking water and basic sanitation actually dropped by two percent between 1990 and 2002. The report did underline some encouraging signs. Efforts to reduce the number of people without access to clean drinking water to 800 million by 2015 are on track, it said, noting that an additional 1.1 billion people have gained such access in the last 12 years. Progress on this front has been especially rapid in Asia, where the percentage of the population with access to potable water has increased from 77 to 83 since 1992. But there are still 675 million people in Asia , and the report estimates that they draw their drinking water from unsafe sources such as polluted rivers and lakes. According to the Asian Development Bank, rural communities in the country, particularly those in small island provinces like Little Margos, generally have inadequate access to safe drinking water. On an average, two thirds of the population in such areas lack access to potable water sources, a figure that is remarkably higher than the Asian average of one in three people. In some provinces, the reported number is even lower. In an effort to bring potable water to the underserved rural areas in the country, the Philippine Government developed the Integrated Water Supply Program from 1986 to 2000. Its mission was to prioritize several services to communities outside major urban areas. Non-governmental organizations such as the Peace and Equity Foundation, have also initiated projects aimed at improving the water system in far-flung rural areas. Envisioning a better community, PEF supports projects that focus on basic services like water systems, livelihood and enterprises, capacity building and calamity assistance. Just July this year, PEF inaugurated a water system project in Little Margos that is expected to end decades of inaccessibility to potable water. 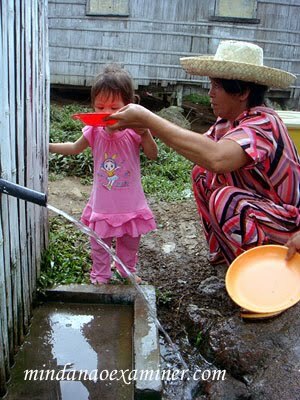 The project, amounting to more than 600,000 pesos, is called the “Little Margos Community-Managed Potable Water System.” It started last October 2007 and it aims to help the 91 households or the 490 residents of the village.